Why has democracy provoked hostility in the past? Has the hostility entirely vanished? * How democratic are contemporary Western societies in reality and how might they be made more democratic? The revised and updated edition of this widely acclaimed survey takes account of the very different global context in which any discussion of democracy must now take place, including the mighty power of the multinationals vis-a-vis elected governments, the resurgence of the idea of an Islamic alternative to the Western democratic ideal, and the suggestion that unelected but powerful international bodies are effectively eroding the authority of the democratic state. Anthony Arblaster looks first at the history of both the theory and practice of democracy, and the fierce opposition it has often provoked, showing how the representative version of democracy we are now familiar with was a relatively late arrival on the scene. 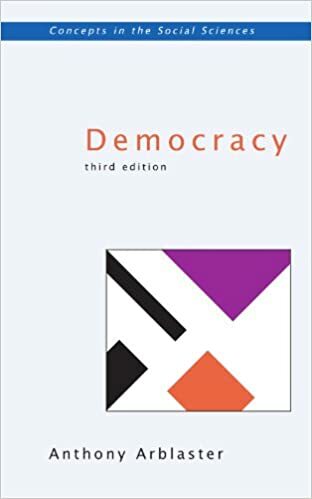 He finds the core of the idea of democracy in the notion of popular power, and in the second part of the book he explores the meaning of this and the problems it involves. Drawing on the classic writings of Rousseau, Paine and John Stuart Mill, he shows how wide the gap is between their vision of a fully democratic society and the limited realities of the Western democracies of today. Democracy, he argues, remains a relevant ideal and a challenge to much conventional political thinking, as well as to the centralizing tendencies of global power.